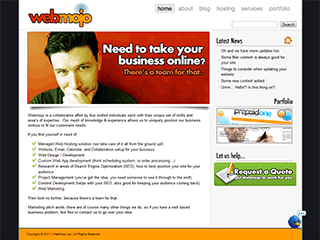 Webmojo is a collaborative effort by skilled individuals, each with their own unique set of skills and area’s of expertise. Our mesh of knowledge & experience allows us to uniquely position our business venture to fit our customers needs. Content Development (helps with your SEO, also good for keeping your audience coming back). Then look no further, because there’s a team for that. Marketing pitch aside, there are of course many other things we do, so if you have a web based business problem, feel free to contact us to go over your idea.